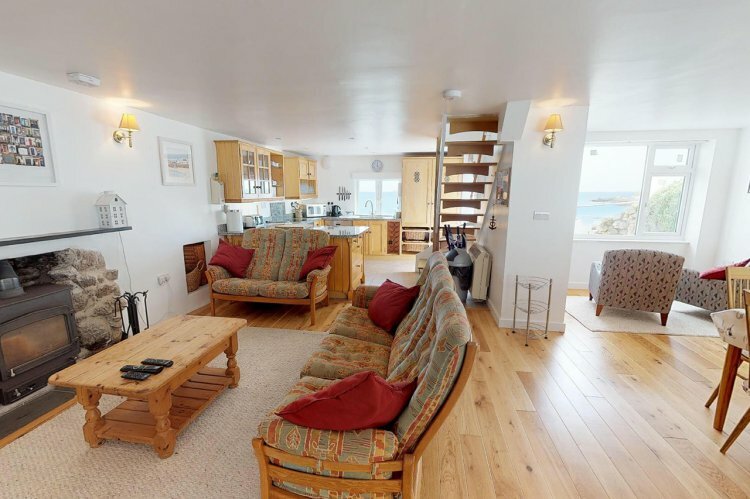 Situated right across the sea front road from the beach at Coverack 'Suncliff' enjoys magnificent sea, coastal, beach and harbour views from the sunny roof-top terrace. With three bedrooms sleeping up to five people, and two bathrooms, this is a great location for a family holiday. The sandy beach is literally over the road and Coverack also boasts a traditional fishing harbour as well as a recommended fish and chip restaurant / takeaway, a traditional pub and a water sports school during the main season which also hire equipment to people. The spacious open-plan ground floor has the main lounge, kitchen and dining area. Up a step at the back is a second lounge, perfect for the kids to escape to, while at the rear is a utility area and further bathroom. On the first floor are the three bedrooms and the shower room. From the first floor you can also access the roof terrace - a purpose built, sheltered terrace with garden furniture. From here the views of the beach and sea are simply breathtaking. At the rear of the property is another sheltered patio area with garden furniture. Kitchen - excellent sea views, granite work tops, plenty of storage, fridge, dishwasher, microwave, electric oven with hob and extractor fan. Lounge - Comfy seating for five people, LCD TV with freesat, BT internet and DVD player. Woodburning stove (first basket of logs supplied). Dining area - Dining table with seating for five and two comfortable chairs to look out over the front patio towards the sea. in DVD player and freesat. Utility Area - Washing machine, vented tumble dryer, second sink and freezer and door leading to the rear patio area. Bathroom - bath, with shower over and matching toilet and handbasin. Bedroom one - Excellent sea and beach views, 5' king-size double bed, bedside tables and lamps, built-in wardrobe and chest of drawers. Bedroom two - Large twin room with two x 3' single beds, bedside table and lamp, built-in wardrobe and chest of drawers. Bedroom three - Single room with 3' single bed, chest of drawers, bedside table and lamp. Shower room - Shower cubicle with mixer shower over, matching handbasin and toilet. Heating throughout is by modern storage radiators. Rental includes bedlinen, towels (bring own beach towels), electricity and first basket of logs. Free Wifi and local calls telephone. Please note that there are car parks either end of the village as well as adequate off-season road parking but N.B. parking on Yellow lines between 1st JUNE and 30th SEPTEMBER is prohibited between 10.00am and 6.00pm. Please note: the stairs to the first floor are steeper and narrower than standard and may not be suitable for the elderly or less able-bodied. Short Breaks are offered at Suncliff but only for a maximum of 2 guests, you can view dates under 'Duration'. For Christmas & New Year availability, please call to discuss your requirements. Over the road from the beach!